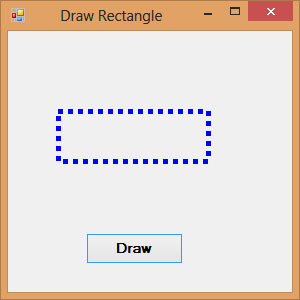 In the previous lesson, we have learned how to create Graphics and Pen objects to draw straight lines in Visual Basic 2019. Now we shall learn how to draw rectangles. *myGraphics is the variable name of the Graphics object and myPen is the variable name of the Pen object created by you. You can use any valid and meaningful variable names. X, Y is the coordinate of the upper left corner of the rectangle while width and height are the width and height of the rectangle. Where the last argument Dot specifies a particular line DashStyle value, a line that makes up of dots here. Other DashStyles values are Dash, DashDot, DashDotDot, and Solid. The following code draws a rectangle with a blue dotted line.